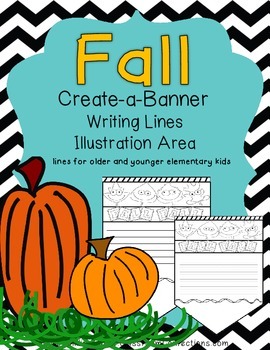 This is a simple fall banner that will make a cute bulletin board or hallway display The banner piece has writing lines and a small triangular shaped illustration area, or you can use that area for something else. I have included two banners. They have different lined areas for upper and lower elementary kids. They can write something fall related, such as what they like about the fall season, or you can have them do something like write a reading response, which would have nothing to do with fall. You can attach the banner pieces to each other or you could even not use them as a banner and have the kids mount them to construction paper. 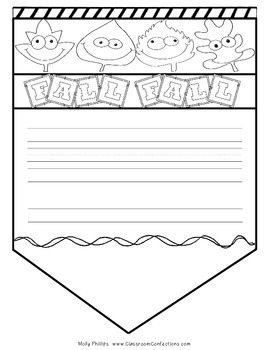 To connect the pieces for a class banner, you can punch holes in the top corners and run ribbon through or staple to the back side. Use in your classroom however you would like. Have fun! For more creative lesson ideas, click on 'elementary lesson' plans by my picture above.